In this video Mr. Kaltofen discusses the hottest hot particle he has ever found, and it was discovered more than 300 miles from the Fukushima Daiichi site. If Fairewinds Energy Education was a Japanese website, the State Secrets Law would likely prevent us from issuing this video. Fairewinds' Arnie Gundersen and Boston Chemical Data Corporation’s Founder Marco Kaltofen have an in-depth conversation regarding the challenges of measuring radiation exposures to people around the globe. Kaltofen explains the methodology involved in measuring radioactive releases from Fukushima Daiichi. Arnie Gundersen appears on Democracy Now to speak about the ongoing effects of radiation on the Japanese people and his recent contribution to the Greenpeace report Lessons From Fukushima. Washington, DC - October 31, 2011 – Today Scientist Marco Kaltofen of Worcester Polytechnic Institute (WPI) presented his analysis of radioactive isotopic releases from the Fukushima accidents at the annual meeting of the American Public Health Association (APHA). Mr. Kaltofen’s analysis confirms the detection of hot particles in the US and the extensive airborne and ground contamination in northern Japan due to the four nuclear power plant accidents at TEPCO’s Fukushima reactors. Fairewinds believes that this is a personal health issue in Japan and a public health issue in the United States and Canada. Ex Japanese Nuclear Regulator Blames Radioactive Animal Feed on "Black Rain"
Arnie Gundersen: Hi, I'm Arnie Gundersen from Fairewinds and it is Tuesday, July 19th. Today, I plan to talk about the condition of the reactors at Fukushima. And more importantly, the radiation that has been detected throughout Japan, not just on the site. And finally, I want to talk about a condition that the Japanese are beginning to call Black Rain. The first thing is the condition of the site itself. All 3 Fukushima reactors that were running, I, II and III, and the fuel pool on Unit 4, continue to release radiation. Now, you do not see it in the day because the days are warm now, but you do see it at night. I have gotten many, many emails about this, where people think that the site is blowing up. In fact, it is steam coming out of these reactors and hitting cold air from the Pacific. So they continue to release radiation. But most of the radiation from Fukushima was released in March and in April. At this point, there is a lot less radiation every day than there was in March and April. About 90-95% of the radiation from Fukushima was released in the first 6 weeks of the accident. While it continues to release radiation, there is nowhere near as much on a daily basis. On the other hand, Fukushima may be continuing to release radiation for a long time. The Japanese are building large tents to put over each of these reactors. The first tent is in fabrication now and it will cover reactor 1, and then they will move to reactor 2, and reactor 3, and finally reactor 4. Those tents are designed to prevent the steam from getting out and to collect it as water and treat it. So beginning in September, most of the airborne radiation will be eliminated from Fukushima, at least Unit 1. More and more though, we will wind up with the contaminated ground water and the contaminated liquids that are on site. There is nothing in the foreseeable future to eliminate those. As a matter of fact, the Japanese announced that it is going to be 10 years before they begin, begin to remove those cores from the bottom of the containment. There is no technology right now to remove them. Remember they have melted through the nuclear reactor and they are lying on the floor of the nuclear containment. At Three Mile Island, they had melted onto the bottom of the reactor, but not through the reactor. So this is brand new. It is sort of like trying to peel an egg off the bottom of a frying pan. If it is cooked too long, it is a very, very complicated and difficult process. And that is what we are facing at Fukushima in the long term clean up. So in the meantime, there will be an awful lot of liquid radioactive waste that will have to be processed for 10 or perhaps 20 years. Well, in my mind, the more concerning thing is the information that has been coming in from off site lately. Some friends of mine are biologists that had worked at Chernobyl and went to Japan to do some scientific work over there. They went anticipating things were going to be bad. I got a call this week from them and they said that things are really, really bad. So these are hardened scientists that are used to dealing with radiation and they believe that conditions at Fukushima are much worse than they had thought. There is some corroborating evidence that has come in on that. The first is that mushrooms between 30-40 miles from the reactor, are found to be contaminated well in excess of what the Japanese are allowing. The interesting part of that is that the mushrooms were grown indoors. So how can a mushroom grown indoors exceed the radiation standards that the Japanese have set? It is a major concern and again, it is 35 miles from the accident. The second piece of corroborating evidence, is that cattle have been contaminated throughout the Fukushima Prefecture and beyond. In the last week, first it started that 8 cows were contaminated and then it became 40 cows and now it is over 130 cows that are contaminated, and I am sure that number will go up as time goes on. Now there are a couple of interesting things here. First is that the cows were 30-40 miles from the reactor and their cesium levels are well in excess of anything anyone has ever approved for human consumption. When the cows got to market, the Japanese did not sample the meat, they rubbed the hide of cow to see if there was any contamination. And based on rubbing the hide of the cow, they released it to market. It was only after that, that it was discovered that the meat was contaminated. That is not an acceptable way of measuring beef. But the more important issue here is, how did the cows pick up that contamination when everyone thought the cows were being fed silage, in other words, straw that had been saved from before the accident? It turns out that the Japanese use the stalks of rice to feed their cows. And farmers out at 45 miles and beyond, were cutting their rice stalks down and shipping it in to the farms that were inside the Fukushima Prefecture. The straw was contaminated to 500,000 disintegrations every second, in a kilogram of straw. Now this is cesium. It has got a 30 year half life. But 30 years from now, it is still going to be disintegrating at 250,000 disintegrations per second. And 30 years after that at 125,000 disintegrations per second. That is what this term half life means. This occurred out at 45 miles. You will recall that the Nuclear Regulatory Commission suggested evacuation out beyond 50 miles. This appears to indicate that the NRC was right. The Japanese should have evacuated their population out beyond 50 miles and instead stopped at around 12 – 18 miles. This contamination then has spread beyond the Fukushima Prefecture. Yet, the Prefecture itself seems to be the only place the Japanese are worried about this radioactive exposure. The last thing I would like to talk with you about today, is what happens outside the 50 miles that we have just been talking about. It is already pretty clear based on the radiation in the straw that we have discovered that radiation, even out as far as 50 miles, is as high in some areas as Chernobyl was. Well, what about further? Let's take a look at Tokyo and I am concerned there too. First, the sewage treatment plants in Tokyo have contaminated their sewage sludge. Normally, that material is used in building construction material. But it is so radioactive that it has to be stored outside under tarps, until someone can figure out a way to get rid of it. The second thing is, a Japanese gentleman sent me a lab report. This person took it into his own hands to pay for a lab to analyze data on a street near a playground in Tokyo. Here is the lab report. It shows that there are 53,000 disintegrations per second in a kilogram, that is 2.2 pounds of material, on the side of a street near a playground in Tokyo. This person was so concerned that they went to the mayor of that town and the mayor said, I am not worried about it. Here is a citizen that with his own money, paid for a lab report and could get nowhere with his local government. Well, there is another piece of data. And that comes out of the National Cancer Center hospital near Tokyo as well. It has been on their website since a couple of days after the accident. The report shows that on March 24th, that is 9 days after the accident, the radioactive background outside the hospital was 30 times higher than the radioactive background inside the hospital. There was deposition of hot particles on the soil. And it was significant enough to increase the amount of radiation that the detectors were picking up by a factor of 30. Now a national cancer hospital clearly knows how to measure radiation, so these are experienced scientists. The last report I want to share with you is every day, I get an email from a prominent Japanese physicist named Dr. Glen Saji. He was their secretariat of the Nuclear Regulatory Commission in Japan. He wrote two days ago, this. And it has to do with the straw that has been discovered near Fukushima. "I believe it is due to storing straw in a field at the time the plume passed by during the first week of the accident, in particular, due to the Black Rain." Now Black Rain is not a term I am sure he uses lightly. But it clearly was experienced in Japan after the accident. What he is referring to there is clouds of radioactive hot particles depositing everywhere in northern Japan. Well, the Japanese are resourceful people, as evidenced by their world cup win on Sunday. But they need to know the magnitude of the problem they are facing in order to handle it correctly. Rather than limit the information, it is important that they limit the radiation. Thank you very much and I will get back to you. Original estimates of xenon and krypton releases remain the same, but a TEPCO recalculation shows dramatic increases in the release of hot particles. This confirms the results of air filter monitoring by independent scientists. Fairewinds' Arnie Gundersen explains how hot particles may react in mammals while escaping traditional detection. Reports of a metallic taste in the mouth, such as those now being reported in Japan and on the west coast, are a telltale sign of radiation exposure. Arnie Gundersen: Hi I'm Arnie Gundersen from Fairewinds. There has been a lot of discussion in the press in the last week about Tokyo Electric changing their estimate for the amount of radiation that was released at Fukushima, and there has also been a lot of discussion about radioactive hot particles being discovered all over Japan. I wanted to tie those two together today and talk about just what that means. First, Tokyo Electric recalculated the amount of radiation that came out of Fukushima in the first week. And they discovered that that first week released twice as much radiation as they had thought was released in the entire accident. So it released an enormous amount more than they anticipated. But the second piece of that, is that most of these new numbers, most of these new radiation particles, were hot particles. And here is why. Right after a nuclear fuel melts, it releases all of it's gasses and those gasses are called Xenon and Krypton. They are noble gasses, they don't react and they surround the population, bombard the population, with gamma rays. Now that part of the calculation is pretty straightforward. That part doesn't change with this new estimate from Tokyo Electric. So the Xenon and Krypton part of the estimate is there. But what has changed is that they have realized that an enormous amount more hot particles were released. Now even then, this is an assumption, remember all of the radiation detectors were blown to smithereens. And still they are assuming that about 98% of the radiation is still inside that reactor. But this new radiation is in the form of hot particles. What are they? Cesium, Strontium, Plutonium, Uranium, Cobalt 60 and many, many others. When you go outside and you are in a cloud of noble gasses, you could pick it up with a radiation detector, because you are bombarded by gamma rays. But when you are in hot particles, unless there are many, many, many, it is very difficult to detect a single hot particle. But that doesn't mean it is not dangerous. We are discovering by scientists, independent scientists, using air filters in Japan, that the average person in tokyo breathed in about ten of these hot particles every day all the way through the month of April. Those same scientists, using air filters, are discovering that in Fukushima, people were probably breathing in 30 or 40 times more radiation than they were in Tokyo, again in the form of a hot particle. What surprised me is that the air filters in Seattle, indicate that the people there were absorbing 5 hot particles every day for the month of April. What does that mean? It means that that hot particle gets absorbed in your lung, or it winds up in your intestines or it winds up in your muscle or it winds up in your bone. It constantly bombards a very narrow piece of tissue. Now we have here a picture of a lung from an ape and there is a hot particle in the lung. And you can see how localized the damage is from that hot particle constantly bombarding the ape's lung. Now a constant irritant like that your body fights, and most of the time your body wins. Sometimes however, those hot particles can cause a cancer and of course, that is a grave concern. Now you can't run a geiger counter over someone's lung on the outside to determine if they have a hot particle. Because those particles, those rays, don't travel outside the body. They do their damage to the local tissue. But we know they are there, because the air filter results indicate that they are. Since I was about 16 years old, I used to work on cars a lot. I know that if I was working on a car in Japan right now, I would be using gloves and a respirator if I was removing the air filter in a car, because I know that there is radiation on those air filters. That is what the independent scientists are telling us. The last thing I would like to talk about tonight is that there have been reports coming out of Japan, of individuals tasting a metallic taste. Now this is not the first time that that metallic taste has been detected after a nuclear accident. People near Three Mile Island detected a metallic taste in their mouth. People near Chernobyl detected a metallic taste in their mouth. Also, patients undergoing radiation therapy for cancers also have detected a metallic taste in their mouth. This is anecdotal. It is very difficult to measure, but that we are seeing it in Japan confirms what has already been detected at Three Mile Island and at Chernobyl. That's about it for tonight. Next week, on Thursday, June 16th, I will be at the Boston Public Library between 6 o'clock and 8 o'clock at night. 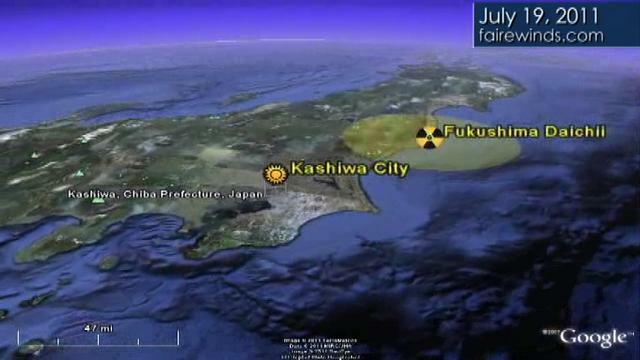 The topic is: Fukushima - Can It Happen Here In The United States? I will be with David Lockbaum from the Union of Concerned Scientists and Dr. Richard Clapp, an epidemiologist. If you are in the Massachusetts area, it would be nice to meet you there. Thank you and I will keep in touch.